Wang Anshun (1957 - ) was the standing member of Gansu Provincial Party Committee and director of Gansu Provincial Organizational Department from 1999 to 2001. 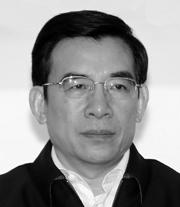 From September 2001 to March 2007, Wang was the deputy secretary of Shanghai Municipal Party Committee. Since March 2007, Wang was deputy secretary of Beijing Municipal Party Committee and head of the Political & Legal Affairs Committee (PLAC) of Beijing. Wang Anshun was the vice mayor of Beijing since July 25, 2012, and mayor since Jan. 28, 2013. Since the start of Chinese Communist Party (CCP)’s persecution of Falun Gong in1999, Wang Anshun has been following the genocidal policy against Falun Gong and thus, bears unescapable responsibility for the brutal persecution against Falun Gong practitioners. On January 31, 2001, soon after the CCP staged the "Tiananmen Square self-immolation” hoax, Wang Anshun, then standing member of Gansu Provincial Party Committee and director of Gansu Provincial Organizational Department, gave a speech at a Provincial Organizational Department meeting. Wang used the “self-immolation” hoax to slander Falun Gong, incite hatred and demanded “extreme alignment with the CCP Central ideologically, politically and in actions." In March 2007, Wang was transferred to Beijing from Shanghai. As the vice mayor and later mayor of Beijing and the head of Beijing PLAC, Wang enforced the persecution policy against Falun Gong. Especially during the 2008 Olympics, in the name of “Olympics security,” Beijing police detained large number of Falun Gong practitioners. On Jan. 12, 2008, Wang Anshun attended a meeting about “safeguarding Olympics security” as the head of the Beijing PLAC. The meeting identified Falun Gong as the top target to crack down. From January to July 2008, at least 586 Falun Gong practitioners were illegally arrested in Beijing. Some of which were persecuted to death. At around 10pm on Jan. 26, 2008, musician Yu Yu and his wife were on their way home and were arrested by the police because of their being Falun Gong practitioners. Yu Yu was persecuted to death a few days later. Falun Gong practitioner Lang Fengxian (female, 60 years of age) from Chaoyang district was arrested 3 times from January to May 2008 and eventually died in June 2008. On June 14, 2011, Falun Gong practitioner Du Juan (57 years of age) from Chaoyang district was persecuted to death in Beijing Women Prison. She left behind a 10 year old son and a 90 year old father. On July 29, 2009, Wang Anshun was the deputy director of the Beijing Municipal Party Committee. He attended an anti-Falun Gong meeting and demanded all levels of Party committees and government agencies to carry out the persecution policy and labeled it an important task to ensure the governing status of the CCP. On Nov. 13 and 14, 2010, Wang Anshun, as the deputy director of the Beijing Municipal Party Committee, gave a speech at the ten year anniversary of “China anti-cult association and China Care Association.” The so-called “China anti-cult association and China Care Association” is an organization consists of so-called scholars with the sole purpose of persecuting Falun Gong. In the past 15 years, according to incomplete statistics, there are at least 9,350 Falun Gong practitioners arrested in Beijing, and at least 246 were persecuted to death. As of Sept. 6, 2013, there were at least 58,980 online reports about the persecution in Beijing. In April and May, 2014, at least 60 Falun Gong practitioners were taken to the brainwashing centers. Beijing is one of the places where the persecution of Falun Gong is most severe. Because of his active participation in the persecution, Wang Anshun is suspected of committing the crime of genocide, crimes against humanity and crime of torture. WOIPFG’s principles are: whoever has committed the crime is responsible for it, individuals are responsible for organized crimes, instigating a crime is the same as directly committing a crime. Based on these principles, all the crimes conducted in the name of organizations, units, and systems will eventually be the responsibility of the individuals. All the responsible persons who have participated in the persecution of Falun Gong will be investigated thoroughly and be brought to justice. Established in 2003, WOIPFG has the mission to investigate the criminal conduct of all institutions, organizations, and individuals involved in the persecution of Falun Gong, to bring such investigations, no matter how long it takes, no matter how far and deep we have to search, to full closure, to exercise the fundamental principles of humanity, and to restore and uphold justice in society.